*Mythos wrote: I have often wondered if ostrich feathers are correct for crests: would they have been obtainable in the C14 and C15? The Life of King Edward the Confessor - c. 1250-60. I am somewhat confused, as the picture to which I think you are referring is indeed peacock feathers as stated on the picture itself, and to which I made reference myself. Nevertheless, I agree with you as to the date of appearance for ostrich feathers and would guess that the first would have made an appearance around the time of the Crusades. It is likely that Crusaders (or their entourage) would have been able to acquire them in the Middle East from Africa. Peacock feathers, of course, would have been readily available in Europe from earlier times, although I would think this is not a native bird either. I have just re-read the thread only to realise that your question about ostrich crests was a separate issue to the website on peacock crests yet in the same post! I assumed that the two had become confused, and that the website was intended to relate to your question about peacock crests! I don't think the Life of King Edward the Confessor manuscript had been referred to previously and it is the earliest I have seen a peacock crest, although this is not a subject I have studied in any depth. I hope it was of interest anyway! As for ostrich crests, the earliest example that I have come across for a depiction of an ostrich feather as a helmet crest is from the Apocalypse Tapestries in Angers castle (dated 1375-1382). Again, I have not studied this subject in great depth, so there may be earlier examples and I would be very interested in seeing any. Looking at the original posting, I can see why you were confused, Sir George, as I did juxtapose the two ideas. I was wondering about the ostrich feather as crest because it is widely used nowadays by re-enactors at places such as Tewkesbury, and with reference to your research and that of Craig1459 (earlier posting: "Petty Custom Account 1480-1: Bernard Senterion [S Barnabas Senturyon], A, 1 brl. with 6 [S C.] bundles ostrich feathers, £4") it would seem eminently sensible. 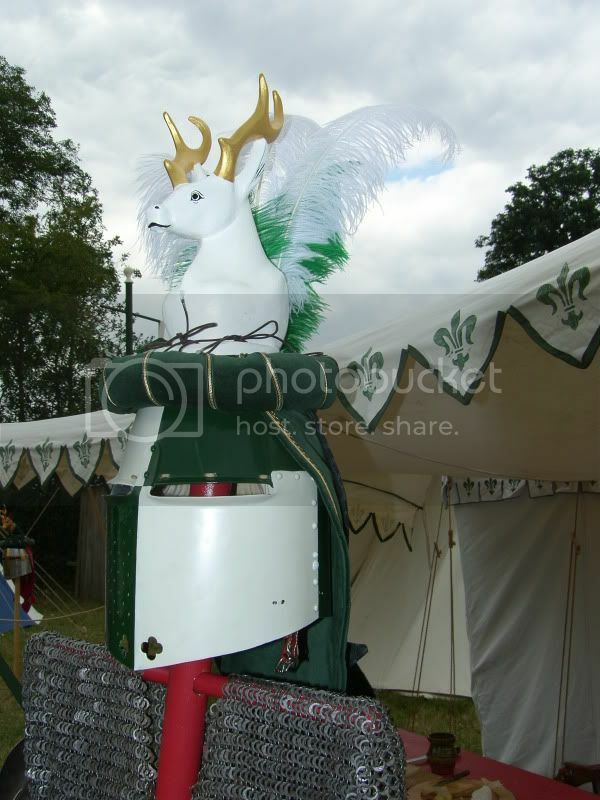 The picture you link to is interesting as it shows a bascinet with an ostrich crest, which I have never seen before. It would certainly match the date you suggest for the arrival of this sort of crest. Some pretty impressive crests! Out of interest, what are they made of? Fabric and feathers yes but the rest carved out of wood? I would have thought that weight would be a consideration! My crest is actually made of plastic...but don't tell anyone! I think the norm for crests might well have been leather over a wire frame (cuir bouille): strong enough, but light also. Any other suggestions? *mythos* wrote: My crest is actually made of plastic...but don't tell anyone! Yes, Latheaxe, indeed it is yours...and a fine effort it is, too. The only problem with buying second hand is that it requires creating comparable arms and shield and so on to go with the original. Hence, it is entirely possible that you might meet yourself on the battlefield sometime! 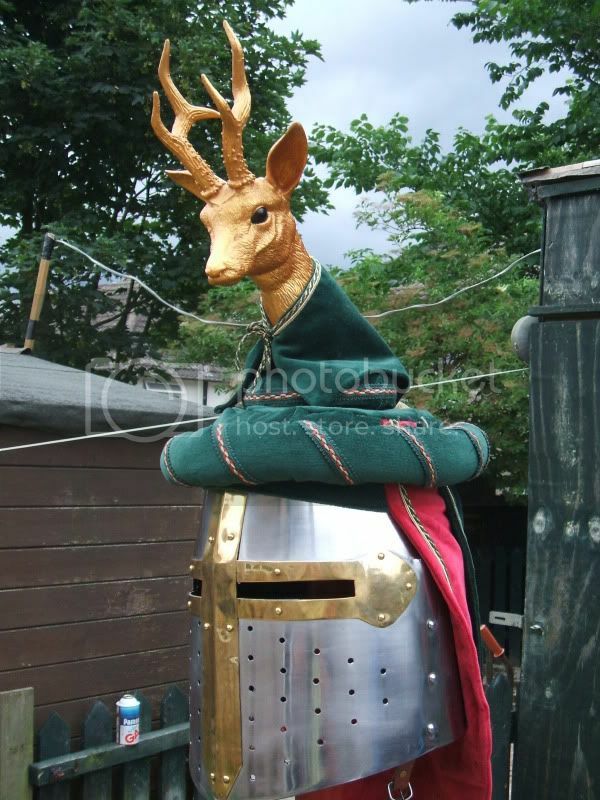 Actually, I have to admit that I would not put your helm and crest at jeopardy, so it is occasional parades only where it fulfils its purpose admirably. Of course, I am based in Scotland, so you are not likely to encounter me, in fact. Making out of light wood must be quite difficult, time consuming and probably expensive, and I doubt that you would be putting your crests at risk? I am an armiger myself and hence will eventually wish to have a correct crest made for my own helmet (once other expenses feed through the system). I imagine even knights of the time would have balked at the expense of replacing crests at regular intervals after tourneys: or perhaps they were happy to do so as a measure of their wealth. Here's mine, it arrived this week. 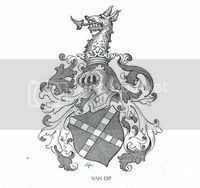 When I saw Mr. Muller's work on the Edgecote crests last year I contacted him to discuss the subject as we both have a mutual interest in the subject. I was lucky enough that he would make me one as well and I'm VERY pleased with the results. Handmade according to Cennino Cennini's guide to make crests, by Payson Muller in the UK. It was a great experience to work with him. I got nice updates on the sculpts and leatherwork and if there were any questions from me or him they were sorted out very quickly. I will only use this beauty for display purposes and will order a latex one for actual use later. 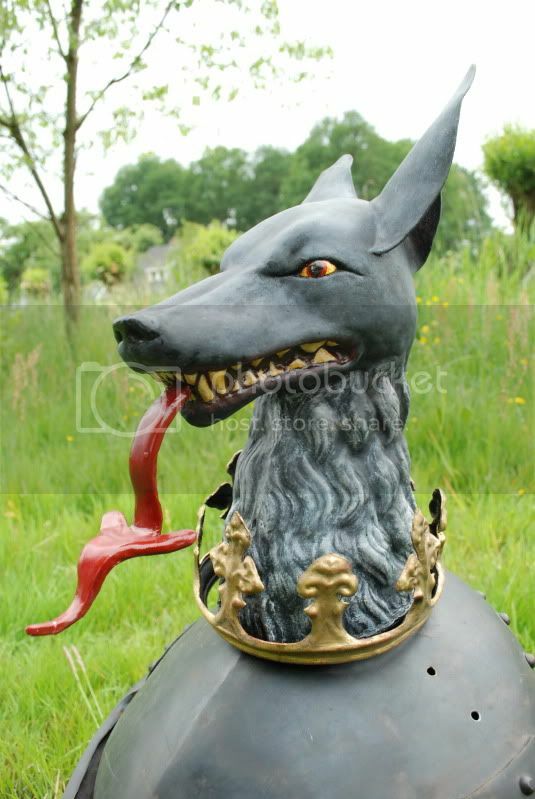 Some descriptions describe it as a dragons' head and authors as a wolves' head, and I think this is a great mix. 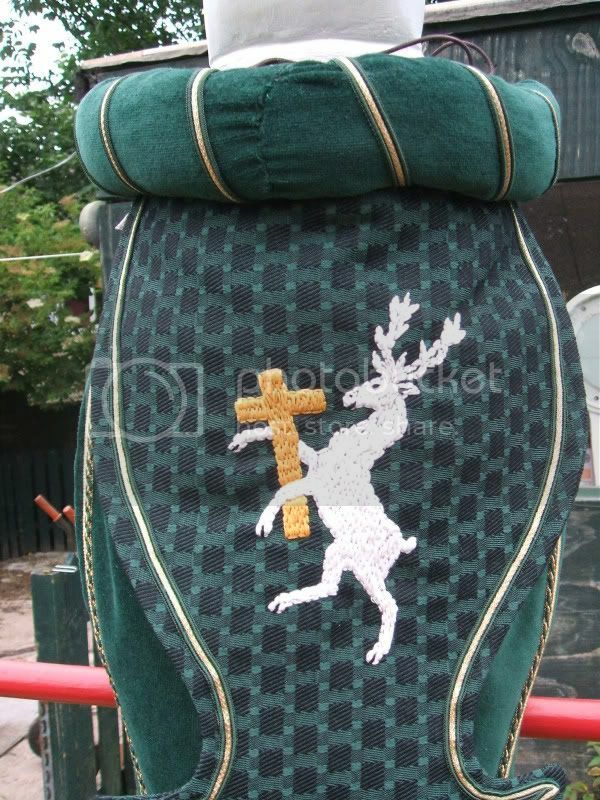 I also have a banner and tabard made for this device, so the set's almost complete. Mr Muller has done a superb job for you, Ben. Bravo to him! It will be interesting to see you in your complete ensemble when all is finished. Please post some photographs then. This continues to be a fascinating thread! 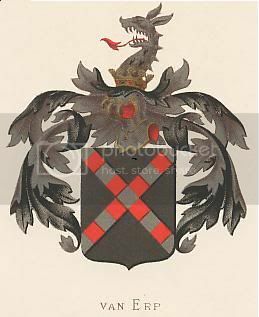 It is interesting to note that crests are still extant in the modern world as part of the full "achievement" of armigers (those who hold registered arms).The Victorians were extremely keen on all things Gothic and revived the fascination with heraldry, but two world wars rather put this on the back burner for some time. However, it is becoming increasingly popular once more for individuals to formulate their own arms and to display them proudly on special occasions. 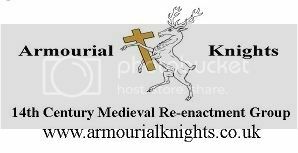 The process of petitioning for one's arms is a measured one: attention has to be paid to previous registrations under the same name, and the core principles of heraldry must be observed. It is not just a matter of looking pretty or splendid, although for many these are considerations too. Out of interest for those who might think either of having a crest for their helm, or who might think of petitioning for arms, I add here a link to the Heraldry Society of Scotland, whose members' arms section not only illustrates a wonderful variety of arms with crests, but also gives many useful insights into the thought process behind the development of the final arms. re peacock feathers, there was one found archeologically in London, late 13th or 14th. Its in one of the MoL books but don't have it to hand. Soreal ones no problems for the right kind of chap with a deep enough purse, same with ostritch heathers. Here's a couple from Germany. Two superb images, Errent Knight, which are greatly enhanced by the colouring. 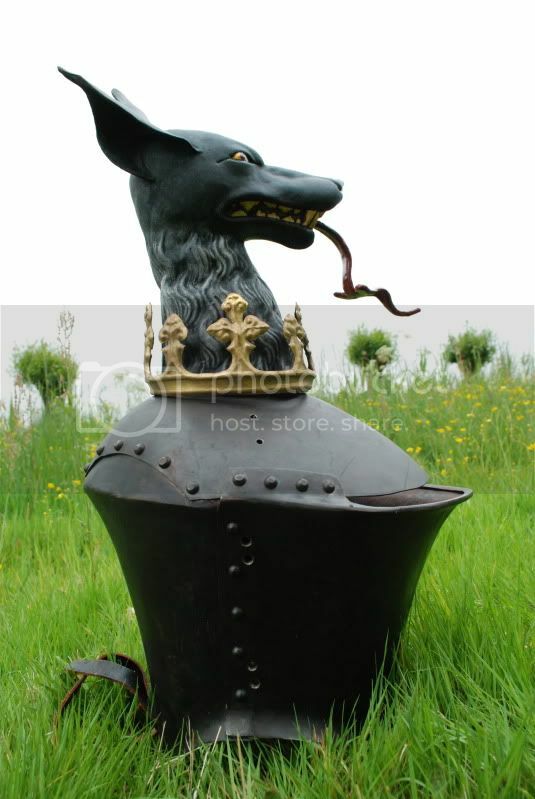 This is a splendid source of reference for the armour of the time. I am impressed by the size of your horns, by the way: good for the lists but perhaps not the tourney? But then it is all about show, is it not? Thanks, Mythos. From all the crest images I've seen, the general rule does seem to have been the bigger the better. 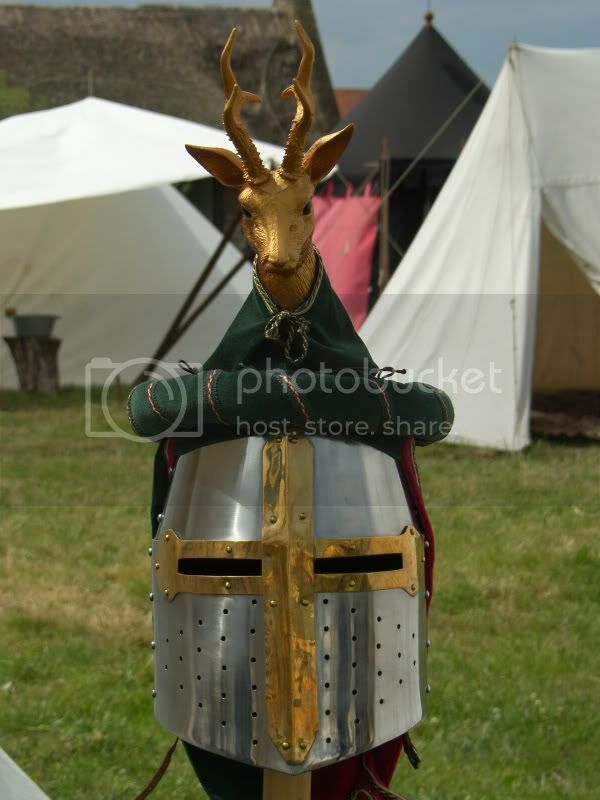 But you're right about it's practicality, I just wear it for the walk out and switch to a simpler helm for the actual combat. New crest for my great helm. 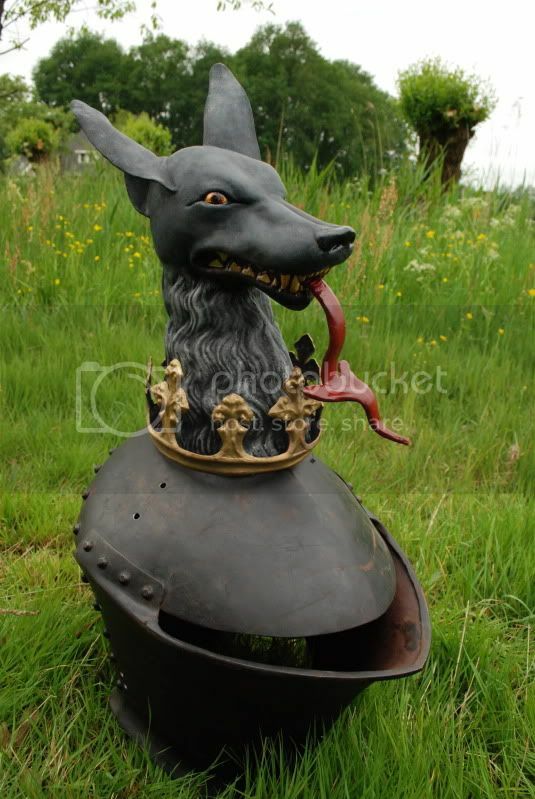 I see from your previous posts that you have refined your crest somewhat Errent Knight. I think this is somewhat better, as it is placed on top of the helm rather than out of the sides. You would certainly be hard to miss on entering the lists. Very good.